Smart hair tools that are conscious about keeping hair healthy? I’m in. Ever since my hair has grown back to its glorious (pre-bleached blonde) long, luscious and healthy state (I’m completely claiming it! ), I’ve been all about MAINTAINING, MAINTAINING, MAINTAINING. This has led me to be extra conscious about keeping all my hair products, and more importantly, my hair tools, high quality in order for less damage. 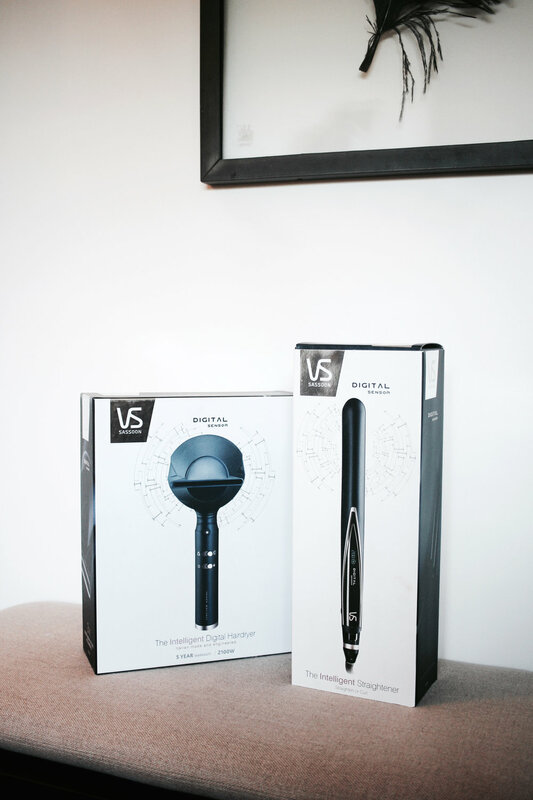 Two hair tools that I’ve recently added into my routine are the VS Sassoon Digital Sensor Hairdryer and the Digital Sensor Straightener. Let’s start with drying our hair. I used to think any old hair dryer would do and to be honest, the tool has one basic job right? - to dry your hair. In saying this however, hair dryer’s can get bloody HOT and that's not exactly ideal, especially if you wash and dry your hair often throughout the week. What I love about the Digital Sensor dryer is that it maintains a safe temperature of 70 degrees - protecting it against heat damage while drying your hair perfectly and reducing frizz (the ions do an amazing job of conditioning the hair too). There are a couple settings on the dryer depending on how high you want the airflow to be (I like it on the highest setting to dry my hair super quickly), but what you will notice is that the heat isn’t that hot, yet the results are exactly what you’d expect from a pro blow wave - genius! I also love using the “straightening” attachment which is a super focused nozzle for concentrated airflow, perfect for smoothing the hair down creating sleek straight hair without a straightener. The dryer also comes with a diffuser and regular “styling” nozzle attachment. Now that our hair is dry and smooth, it’s time to style with the Digital Sensor Straightener. This is where VS Sassoon’s super smart technology really comes in handy. Innovative technology in straighteners is quite important, straighteners should be able to recognise the state of your hair and adjust its temperature accordingly - which is exactly what the Digital Sensor straightener does with it’s heat protect mode. Depending on your hair type, there are 12 different heat settings - my tip is to always start with a lower temperature and work your way up and gauge what your hair texture needs. It’s better to start lower than on a smack bang high temperature that your hair probably doesn’t need. Using the Heat Protect Mode, I initially had mine set to 235 degrees and after one pass the straightener recognised the level of moisture in my hair and adjusted the temperature down to 190 - super clever! What I love about the Digital Sensor straightener is that it works effortlessly to straighten or curl hair - and the result is also smooth, shiny hair. Hair styles are always so much easier to achieve with a great straightener.